Neural Therapy is a treatment system for chronic pain and illness. It involves the injection of local anaesthetics into autonomic ganglia, peripheral nerves, scars, glands, trigger points, and other tissues. It is believed to act through normal­izing the illness-related dysfunction of the nervous system. Even though certain Neural Therapy procedures are widely used in the U.S. (regional anaesthesia, epidural injections, trig­ger-point injections), Neural Therapy as a comprehensive heal­ing system is virtually unknown to most practitioners. In Eu­rope’s German speaking countries it has become one of the most widely used modalities in the treatment of chronic pain. Four theories will be discussed which can explain the dramatic effects that the neural therapy injection can have on the pa­tient’s illness or pain. It has been shown in most cases of chronic illness that there are associated changes in the autonomic nervous system with changes in the membrane potentials of gan­glia and nerve fibers, which lead to changes in conduc­tivity [1,2,3,4,5]. Under certain circumstances, the dys­function can spread to neighboring ganglia and affect both afferent and efferent fibers. Abnormal signals from the periphery can overwhelm the control mechanisms at the spinal cord level (“the gate mechanism,” ) and it can come to a “mass effect” in the spinal cord . The mass effect is a state of electrical chaos at the spinal cord level with failing control and selection mechanisms. Ab­normal neuronal signals are now flooding the brain, lead­ing to disturbances in the central nervous system, auto­nomic nervous system, and hormonal system. The central changes, in turn, facilitate the continuation of the original changes in the periphery, and a vicious cycle is created . Neural Therapy is the attempt to break this cycle. The first step in Neural Therapy is the attempt to find the “primary lesion,” the structure that gave the original ab­normal signal into the autonomic nervous system. In Neural Therapy jargon, this structure is referred to as the “interference field” or “focus.” Frequently, the focus is a site of injury, perhaps a scar or a subclinical illness such as an undetected asymptomatic tooth abscess. Any acute illness can leave the affected structure or organ as an active focus in spite of apparent recovery from the orig­inal illness . An acute upper respiratory tract infection can leave the sinuses as a long-lasting focus creating chronic illness in the affected person. A sinus interfer­ence field is frequently responsible for such varied symp­toms as chronic severe neck pain, migraine headaches, chronic fatigue, and premenstrual syndrome. Once an interference field is suspected or found, it is treated with the use of local anesthetics. We know that local anesthetics restore membrane potentials in nerve cells. The effect is fairly specific to nervous tissue be­cause of the lipophilic character of local anesthetics. Ex­periments by Albert Fleckenstein at Freiburg University in West Germany (the co-discoverer of the sodium-potassium pump in the cell wall and discoverer of the calcium channel), under whom I have studied, have shown that this restoration of membrane potential can outlast the relatively short action of the local anesthetic by days, weeks, months, or years. Fleckenstein explains that once a nerve membrane has lastingly lost its electri­cal potential of — 80 mV and is lastingly hypo- or hyper-polarized, the ion pumps in the cell membrane cannot work and the cell is not only electrically paralyzed but also the metabolism of the cell itself cannot work prop­erly [2,8,9]. Certain waste products of the cell’s metab­olism cannot be eliminated from the interior of the cell and “toxic waste” accumulates inside the cell. This toxic waste is responsible for the perpetuation of the abnormal membrane potential. By restoring the membrane potential for only 30 min or 1 h through injection of a local anesthetic, the function of the cell’s ion pumps in the cell wall is restored for this period of time. The cell uses this time to eliminate a sufficient amount of the “toxic waste” to, often lastingly, regain normal function. This phenomenon can explain the often curative effect of the Neural Therapy injection. The indirect techniques are referred to as “segmental therapy” [1,10]. 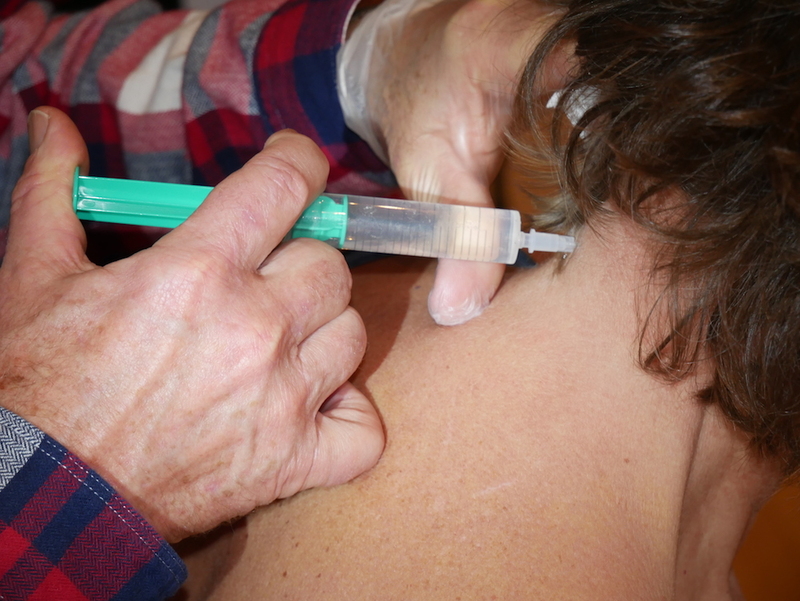 By injecting local anesthetic into the skin surface or periosteum of the same neurological seg­ment in which the ill organ is situated or in which the patient’s pain is located, a beneficial effect can be achieved. This is using the so-called cutaneovisceral re­flex and the periosteovisceral reflex [1,11]. The associ­ated neurological understanding of these phenomena is rather complicated. However, the effect of, for example, infiltrating the skin overlying the lung  leads to in­creased blood flow and bronchodilation within the lung. This has been demonstrated through arteriographic, ther­mographic , and other studies. Paravertebral segmen­tal injections also belong in this category [1,10,13]. The injection of sensory nerve endings and sensory nerves is an indirect technique closely related to segmen­tal therapy and, in this country, is often referred to as “regional anesthesia” [13,14]. It is not completely clear whether the actual injection of the sensory nerve brings the therapeutic effect, or whether it is the anesthesia of the network of autonomic fibers which accompanies each sensory and motor nerve. In osteopathic research and literature, it has been dem­onstrated that the fascia surrounding each muscle and dividing certain muscle groups in the body is all intercon­nected . Along fascial membranes there is, for exam­ple, continuity between the plantar fascia all the way up to the meninges of the brain. An adhesion or scar can affect the fascia by creating tension on it. Tension lines will form along the fascial system and exert disconfigu­ration or displacement at the periphery. An example of­ten used is a bedsheet that is laid out perfectly flat. If one lifts up the bedsheet with two fingers just an inch or so, there will be wrinkles running all across the sheet to the periphery of the sheet, displacing the edge of the sheet slightly. It is easy to understand, therefore, how, for ex­ample, the scar from an appendectomy can tug on the fascia of the abdominal muscles which have continuity with the muscles of the back and the ligaments of the sacroiliac joints. The scar can therefore lead to perma­nent displacement of—or tendency to displace—the sac­roiliac joint. It is not necessary that the scar has actual demonstrable adhesions to the fascia below. The tug on the fascia can also be created by the dif­ferent electrical charge that the scar tissue can have as compared with the normal electrical charge of tissues. (Cells of scar tissue have been shown to be able to hold a charge of up to 1.5 V vs the 80 mV that normal body cells have .) An example that was helpful to me is to imagine taking a sheet of paper (scar), holding it against a wall (fascial membrane), and letting it fall. It will usu­ally glide along the wall and fall down. However, if you rub the paper (i.e., create an electrical charge) while you hold it against the wall, then let go, it will adhere to the wall. It is the same electrical force that will adhere the scar to the fascia below and create the above-discussed tension lines that will have an effect elsewhere in the body. By injecting the scar with local anesthetic, you will create an electrical charge within normal range which can be long-lasting (as discussed in theory I) and the scar will stop exerting its pulling force on the fascia. I have ob­served on numerous occasions that, after injecting a local anesthetic into an appendectomy scar or hernia scar, there was an audible click in the back and the patient’s long-standing back problem had been resolved. The ground-system theory is favored by most neural ther­apists today, even though it is still generally poorly un­derstood. The ground system refers to a new view in understanding the extracellular space [17,18]. The extracellular space is an all-interconnected space in the body. It is composed at the microscopic level of the fibroblasts, the free-ending autonomic nerve endings, the free-ending arterial capillary, the beginning capillaries of the lymphatic and venous system, the cell membrane of the adjacent cell, and the actual material that fills the extracellular space, which is created by the fibroblasts: glycoproteins and proteoglycans. The ground system has certain chemical and physical properties such as electric conductivity, ionic properties, and osmotic properties. This system can have many different phases with differ­ent degrees of these properties. If there is, for example, an ionic change in the system, it will change the conduc­tivity of the autonomic nerve endings, the width of the opening of the beginning lymphatics, the speed of trans­port across cell membranes, the speed and effectiveness of delivery of the hormones through the capillaries, and the nutrient exchange. Changes in the system can occur suddenly and simul­taneously in the entire ground system, which means in the entire body. These effects can only be explained through physics. The model that has been used is the model of a liquid crystal matrix. Liquid crystal can exist in different phases with different characteristics. Let us say we have a plate of liquid crystal which can exist in one phase where it appears to be blue and one phase where it appears to the eye to be red, depending on its electrical state (which in turn determines light refraction and absorption). This plate can be 2 inches long or I mile long. If the experimenter now changes the electrical charge on just one of the millions of liquid crystal belong­ing to the same matrix—given the right circumstances—all the liquid crystal that are in the same matrix will change their electrical state instantly and simultaneously, and the entire matrix that was red before appears now to be blue. The proteoglycans and glycoproteins of the ex­tracellular space have been shown to behave exactly like liquid crystal. A manipulation on a small part of the sys­tem can have a dramatic effect on the entire ground sys­tem by changing the above-mentioned properties. If one looks at illness or chronic pain (for example, chronic chest pain through spasms of the coronary arter­ies) as one possible phase of the system, and appropriate manipulation of the system is performed by the physician (for example, extracting a wisdom tooth which is known in Neural Therapy to frequently cause heart problems [18,19]) a “phase change” in the system can occur at the very moment of the tooth extraction and the chest pain disappears for good. Experiments by Fleckenstein, in the early 1970s, have shown that the injection of novocaine into a lymph node or a lymphatic channel can lead to dramatic widening of the lymphatic channel and to dramatically increased speed of transportation of lymph fluid along the system. He demonstrated also that the lymphatic system can be in chronic spasm in certain areas of the body, not allowing any transportation through its canals. This state can exist for long periods. After injecting a local anesthetic into the affected lymph node, the lymphatic system frequently instantly resumes normal activity. An injection of local anesthetic into the tonsil tissue frequently can relieve chronic migraine headaches [1,10,19,20,21]. The results are often lasting. One could imagine that a blockage in the lymphatic system had ex­isted that was responsible for the migraine (through ac­cumulation of certain toxins within the brain or the mem­branes of the brain). By restoring normal lymphatic drainage, the brain is “detoxified” and the headache dis­appears. 1893 Sigmund Freud discovers anesthetic effect of topical cocaine and recognizes its therapeutic possibilities. 1890 C.L. Schleich: first surgery performed using “in­filtration” anesthesia with 0.1% cocaine solution. 1906 G. Spiess discovers that wound-healing is greatly improved after regional infiltration with novocaine. 1903 Cathelin: first caudal epidural injection with co­caine solution. 1925 R. Leriche: first stellate ganglion block with novocaine. 1926 Accidental intravenous injection of novocaine by Ferdinand Huneke successfully treated a pa­tient’s chronic migraine headache which had been until then intractable. 1940 Ferdinand Huneke injected an itchy osteomyeli­tis scar on the patient’s lower leg with procaine, which cleared her chronic intractable severely painful shoulder at the moment of the injection: the first observed and documented “Huneke phenomenon” or “lightning reaction” [1,3,4,19, 22]. 1940 Hubert Siegen , animal experiments to study allergic phenomena. Two animal species were used: species A (i.e., chicken) and species B (i.e., rabbit). He took a small amount of blood from species A and injected it intracutaneously into species B. Several weeks after the first in­jection he would inject blood from species A in­travenously into species B and the animal would die from an acute allergic reaction (“Schwartz­mann-Sanarelli phenomenon”). If he would in­ject novocaine subcutaneously at the site of the first inoculation at any given time between the first intracutaneous injection and the second in­travenous injection, the animal would not have any allergic reaction from the second injection whatsoever. This experiment proves the point that allergic reactions do not only depend on the presence of antibodies but are also largely de­pend on the “tissue memory.” By anesthetizing the very tissue that holds the memory of the first exposure to the allergen, the antibodies which are present in the blood stream can no longer “over-react” to repeated injection of the aller­gen. A single injection of a local anesthetic last­ingly destroyed the tissue’s memory of the aller­gen. This phenomenon can be explained both through the “nervous system theory” and through the “ground system theory.” Siegen’s research explains why Neural Therapy can be so successful in the treatment of chronic allergies. Any part of the body that has been traumatized or ill can become an interference field [1,5,19,4,18]. An interference field can cause disturbance anywhere in the body no matter where it is located. Every being is a potential carrier of one or several interference fields: 30% to 45% of all illness or pain is caused by an interference field . The overall success rate of treating any given illness or pain with neural therapy by a good neural therapist lies at approximately 65% (treatment of interference fields plus the other Neural Therapy techniques) . An interference field can on its own cause illness or pain. More commonly, the interference field is a link in a chain of interference fields, and for successful treatment all involved interference fields must be found and treated. For example, a woman with pelvic pain improves for 2 days after a Frankenhauser ganglion block [1,10,24,25], then her pain returns. On the next visit, both the thyroid [1,10,24,25] and the Frankenhauser ganglion are injected. The result is now lasting. General illness such as malnutrition , emotional stress, geopathic influences, eating incompatible foods, and other conditions can convert inactive interference fields into active interference fields. For successful treat­ment, both conditions need to be recognized and treated. If only one condition is treated, there will be only partial or temporary improvement. The most frequently overlooked interference fields are (a) the teeth and (b) the intestines. In Germany, the term “frozen regulation” is used frequently. This indicates a condition in a patient who cannot respond to Neural Therapy, acupuncture, home­opathy, and other gentle interventions. The condition is frequently caused by certain medications. The most com­mon are the following: steroids, antibiotics, antihista­mines, and psychopharmaceuticais . The illness is not responding to other therapies. Another type of treatment has made the patient unex­pectedly worse. For example, the patient received an injection into the knee joint for chronic knee pain. His knee became much worse. In Neural Therapy this is called reaction phenomenon and indicates that an in­terference field located elsewhere is causing the knee pain. All symptoms are located only on one side of the For example, a patient has right-sided tinnitus, right-sided shoulder-arm pain and right-sided knee pain. Summation of interference fields: after an appendec­tomy the patient develops rheumatoid arthritis. The appendectomy scar adds one more link to the chain of interference fields which is now strong enough to cause the rheumatoid arthritis. At this point, all in­volved interference fields need to be found and treated. History. What was the last illness, trauma, surgery, dental work before the patient developed his present illness? Systematic Search. This is easiest with a pain patient. Before beginning treatment, a careful range of motion evaluation  (for example, shoulder abduction before treatment only 30°), and a careful reexamination after each Neural Therapy injection (for example, after appen­dectomy scar injection 70°) should be undertaken. During the first session all scars are treated [1,3,19, 25,28,22,4]. After each scar injection the painful joint or illness state is reassessed. During the second session the pelvis is treated [1,10,26,25,28,19]. During the third ses­sion the chest is treated [1,10,28]. Empirical Approach. Certain empirical relationships be­tween the interference field and the illness are more com­mon. Examples include : tonsils–knee joint; abdomi­nal scars–large joints and low back; leg scars–sciatica; tonsils and teeth–migraine; prostate, stomach, and si­nuses–neck; gallbladder scar–shoulder; pelvic scars­PMS, depression, arthritis. It is valuable to understand the energetic relationships that are taught in different “healing systems.” A scar that crosses an acupuncture meridian is more likely to cause disturbance on the structures that are related to this me­ridian than elsewhere. For example, a gallbladder scar is often responsible for chronic hip pain. It is important to understand the tooth–organ relationships [18,19,29]. For example, the four front teeth in the upper and lower jaw are related to the urogenital system and are frequently responsible for pelvic pain, chronic kidney disease, and even malignancy in the pelvic organs. Another example is the wisdom tooth which often is responsible for chronic heart problems. Other valuable systems that I have found are the Chapman reflexes and simply the dermatomal relationships that are known in neurology. Muscle Testing (Applied Kinesiology). These tests will be revealing of such relationships as well . Hidden Messages from the Patient. This is one of the tools that distinguishes a practitioner from an excellent practitioner. While taking the history, the patient may—in between the very important events in his past—mention “some silly little thing” that would usually go by unnoticed. This “silly little thing” may be the very key to the patient’s getting well. While taking the interview, the physician may also notice a scar on the patient’s hand or ear and be drawn to it in some way. By listening to those inner messages and initiating treatment in a way that re­sponds to these messages, the physician will notice that he will be guided to more and more successful treatment. Indications that the correct interference field has been treated. Huneke phenomenon [1,3,4,11,22,19]. There is complete relief of all symptoms for 20 h or longer. If the nerve of a tooth had been injected, the result has to last for 8 h or longer. “Knallkopf ‘ . In translation this term means “exploding head.” This occurs more commonly in women and is a feeling of exploding heat in the head which lasts for several minutes. simply feels extremely good after the injection. Emotional release . For example, after a pelvic injection a female patient has a brief memory of a sexual abuse that happened in her childhood. She feels anger, rage, and tears, which usually are suc­cessfully released within a few minutes. Sometimes a grieving process follows that can last up to several The end result most commonly is, however, that her chronic pain, pelvic pain, or other symptom has completely subsided. Reversed phenomenon. This is equivalent to the term “healing crisis” that has been used in home­opathy and acupuncture. The patient feels a wors­ening of his symptoms but starts to improve after 16 or 20 h.
Indication that the first treatment was given to a struc­ture that is anatomically close to the correct interfer­ence field. There is complete improvement that lasts for less than 16 h. This phenomenon is extremely im­portant to keep in mind. The last treatment was given to a correct interference This was, however, only a link in a chain of several interference fields. The patient’s symptoms improve for more than 16 h, but the improvement is incomplete. The illness or pain is caused by an interference field. However, the interference field is anatomically distant from the site that was last treated. If an intervention was technically correctly performed and the patient experiences an aggravation of his particular symptoms (which can last for hours to several days), and then the pain or illness returns to the original state, this is referred to as “reaction phenomenon”  or “reactivation phenomenon.” The illness is caused by a focus, and a careful interference-field search is in order. The last treatment was given to a particular link in a chain of interference fields. The next link reveals it­self. This is referred to as “retrograde phenomenon”  or “regression phenomenon.” For example, the patient experiences severe neck pain for 1 year. The cholecystectomy scar is injected. The patient calls next day and reports that she has a sore throat and the neck pain is unchanged. Prior to the onset of neck pain, the patient had recurrent episodes of “strep throat.” The tonsils are injected. The neck pain im­proves to some degree but the patient develops pelvic pain. She had a pelvic infection 3 years ago. The pelvis is injected and there is some further improvement. Her appendix scar starts to itch. The appendix scar is treated and there is complete resolution of her pain problem. The appendectomy was done when she was a child. This is a true case of mine and indicates the importance of the patient carefully monitoring changes in his or her own body following each injec­tion, writing them down, and communicating them to the physician on the next visit. It also requires careful listening on the side of the practitioner. End state of chronic illness (patient too weak to re­spond). An exception to the above is the treatment of the dental focus; we have seen a case of chronic schizophrenia improve dramatically after removal of the wisdom teeth. If a patient reports lasting worsening of his condition following correctly applied neural therapy technique, he should be given 10 cc 10% calcium gluconate intrave­nously which should immediately and completely reverse the patient’s condition. I have been required to do this only once in many years of practice. Sometimes patients are unable to “handle” the emotional material that can come up for them after a successful Neural Therapy in­tervention. These patients will sometimes report worsen­ing of their overall condition. Questioning with clarity and compassion, however, will usually reveal the cause of their “worsening” and they can be guided to success­ful psychotherapeutical intervention which in these pa­tients will usually lead to dramatic improvement of their overall health. Neural Therapy is a unique approach to the treatment of chronic pain and illness resulting frequently in rapid and complete recovery. The mechanism of action can be ex­plained with the current understanding in physiology, electro-physiology, physics and neurology. Careful dif­ferential diagnosis should be undertaken to rule out not only the conditions outlined under “contraindications” but also the multitude of “frank” illnesses (e.g., infec­tious diseases, bone fractures, organ lesions) of which pain is not an idiopathic component but an actual patho­gnomonic sign. Neural therapy can thus have a useful place in the treatment of pain . Klinghardt D. Neural Therapy-Intensive. Course-syllabus. American Academy of Neural Therapy, Santa Fe, New Mexico 199? Gerhardt J. Documentation of joint motion. Portland, Ore­gon: Oregon Medical Association Print Shop.